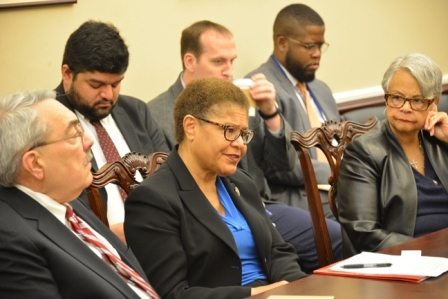 Since CNN’s International report exposed slave trading in Libya, Congresswoman Karen Bass and other members of the Congressional Black Caucus (CBC) have been among the many groups joining forces to bring about freedom and justice for slave trade victims. Recently, Bass provided the Los Angeles Sentinel with an update regarding her work on the front lines to end slave auctions in Libya. Late last year, Bass and her colleagues wrote an open letter to the Libya Ambassador, WafaBughaighis, indicating their outrage and urging the Libyan government to “hold smugglers, traffickers, detention center guards, and anyone else involved accountable.” This resulted in the members meeting with Ambassador Bughaighis on Friday, December 8, 2017. The meeting led to an agreement between Bughaighis and the CBC that the country must immediately end slave auctions and forced labor. To ensure a positive outcome from this agreement, the Congressional Black Caucus will continue to monitor slave trading in the country regularly. Aside from meeting with the Libyan Ambassador to combat slave trading, Bass also introduced House Resolution 644. This bipartisan resolution condemns the migrant slave auctions in Libya and pressures the Trump Administration to develop strategies to rapidly respond to the refugee dilemma in the country. Furthermore, it demands the Libyan government conduct an immediate investigation on the slave auctions that are currently taking place. Lastly, the resolution asks that the African Union conduct its own investigation into the heinous crime.